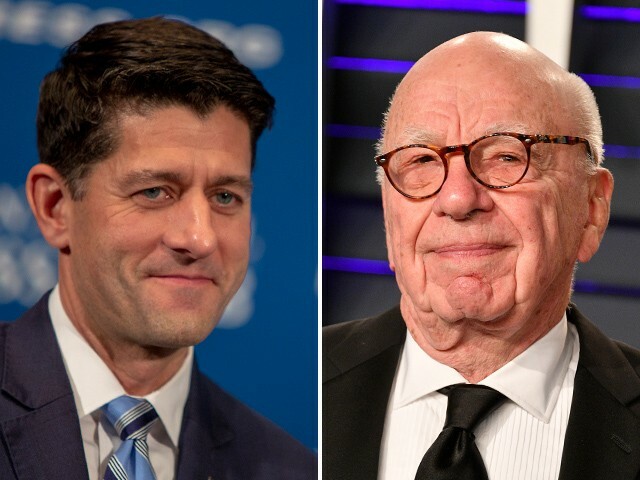 Former Speaker of the House Paul Ryan (R-WI) is joining Fox Corp.’s board of directors, the media giant announced Tuesday morning. Ryan and Formula One Group executive chairman Chase Carey will join Rupert Murdoch, Lachlan Murdoch, and Jacques Nasser as members of the powerful board. Aragon CEO Anne Dias and Hernandez Media Ventures chief Roland A. Hernandez have also been added. “We are thrilled to welcome our new colleagues to the FOX board. We look forward to working with and being guided by them as we begin a new chapter, steadfastly committed to providing the best in news, sports and entertainment programming,” Lachlan Murdoch said in a statement. The additions to the board came as Fox separated Tuesday from the corporation’s entertainment assets that Disney is expected to take over at midnight Wednesday.